My column in the October issue features the article Four Practices, which originally appeared here on my blog on March 5, 2016. Four Practices describes why I avoided punitive and/or rewards systems for behavior management in my work as a teacher, instead choosing to emphasize behavioral ideals (virtues). I used Four Practices for many years in my classroom every day, and believe that they can transform not only your classroom, but also your students’ lives! You can read the October 2016 issue of Choral Director online here. 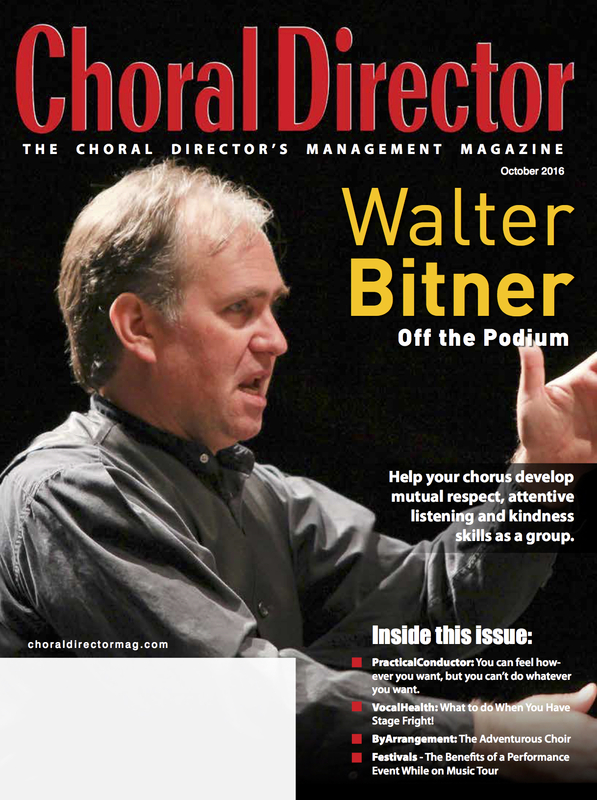 Choral Director is the leading industry publication for middle and high school choral directors in the United States (exclusive of publications from professional associations like ACDA). It is published six times per year and reaches over 16,000 school choral directors across the country. Subscriptions are free and available in either print or digital format. If you are a choral music educator or industry professional, subscribe here. By walterbitner in Education, Music Education, Pedagogy, Philosophy on October 8, 2016 . Nice chance to read four practices again. ..
about time you got a real job. bravo! I know, past time – thanks, Ron! Yay! Way to go, Walter! Thank you, Sohee….I’m working on it!